Abstract: Cooling atomic gases to nanokelvin temperatures has revolutionized atomic physics. At nanokelvin temperatures, new physics emerges: Bose-Einstein condensation, superfluidity in gases, strong interactions and correlations. At nanokelvin temperatures, the atoms are so cold that they can easily be manipulated by electromagnetic fields. This has led to miniaturized atom traps or atom chips, and offers a new perspective for atom interferometry. Recently, a new form of high-temperature superfluidity has been discovered. In the future, we plan to use ultracold gases to create designer matter, i.e. to realize new forms of matter in the laboratory which have been discussed as model systems for many-body phenomena, but have not been observed in nature. Biography: Wolfgang Ketterle received a diploma (equivalent to a master's degree) from the Technical University of Munich (1982), and a Ph.D. in Physics from the University of Munich (1986). After postdoctoral work at the Max-Planck Institute for Quantum Optics in Garching, Germany, the University of Heidelberg and at MIT, he joined the physics faculty at MIT (1993), where he is now the John D. MacArthur Professor of Physics. He does experimental research in atomic physics and laser spectroscopy and focuses currently on Bose-Einstein condensation in dilute atomic gases. He was among the first scientists to observe this phenomenon in 1995, and realized the first atom laser in 1997. His earlier research was in molecular spectroscopy and combustion diagnostics. 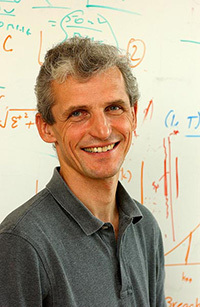 His awards include a David and Lucile Packard Fellowship (1996), the Rabi Prize of the American Physical Society (1997), the Gustav-Hertz Prize of the German Physical Society (1997), the Discover Magazine Award for Technological Innovation (1998), the Fritz London Prize in Low Temperature Physics (1999), the Dannie-Heineman Prize of the Academy of Sciences, Göttingen, Germany (1999), the Benjamin Franklin Medal in Physics (2000), and the Nobel Prize in Physics (2001, together with E.A. Cornell and C.E. Wieman).